This article is about the suburban area in Salford. For the park in London, see Roe Green Park. 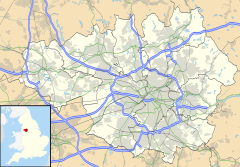 Roe Green is a suburban area of Worsley, in the City of Salford, Greater Manchester, England. Historically in Lancashire, it was anciently a hamlet built around what is now the village green. It is the largest of the City of Salford's conservation areas, selected because of its village green, an unusual feature in the region. Roe Green is adjacent to junction 14 of the M60 motorway. Roe Green was first mentioned in a land dispute between Gilbert Sherrington of Wardley Hall and Richard Brereton of Worsley. Roe Green became part of the manor of Worsley where it remained until 1899 when control passed to Worsley Urban District Council from the Bridgewater Trustees. The green was unenclosed common land, used for grazing with a pinfold where stray animals were kept until released on the payment of a fine. The western end of Roe Green was named Beesley Green after a family who farmed there. At the end of the 18th century the settlements grew considerably and many of the cottages, built by the Duke of Bridgewater, date from this period. These include Beesley Hall a farmhouse that was converted in the mid-19th century into three cottages. The inhabitants worked in the Duke of Bridgewater's coal mines, in agriculture and, until the arrival of cotton mills, in handloom weaving. Beesley Green was separated from Roe Green in the 1860s when the London and North Western Railway Company opened the Tyldesley Loopline from Eccles to Wigan via Tyldesley dividing the green. In 1870 a colliery line to Bolton via Little Hulton was opened making Roe Green a junction. The railway lines closed in 1969 and the disused railway cutting dividing the two greens has been re-developed as a linear walkway. Wikimedia Commons has media related to Roe Green. ^ Farrer & Brownbill 1911, pp. 376–392. This page was last edited on 10 November 2018, at 17:30 (UTC).